Raw pet food, made easy and affordable. 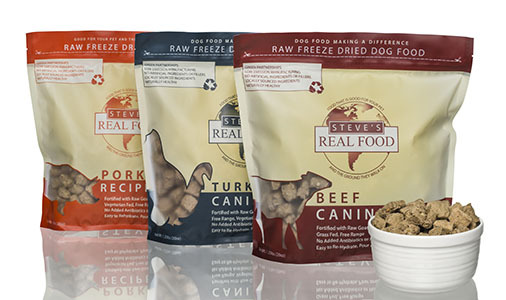 Steve’s Real Food for Pets is a Pioneer in the Raw Pet Food Industry, being one of the first companies to nationally distribute a raw meat dog food. Steve’s products contain the perfect balance of meat and vegetables and make giving your pet a raw food diet easy and affordable. Dogs and cats are natural carnivores and require real raw meat and whole, natural, minimally processed foods. Their evolutionary diet was almost grain-free and contained thousands of enzymes, phytochemicals, and antioxidants that cannot exist in any heat processed foods. 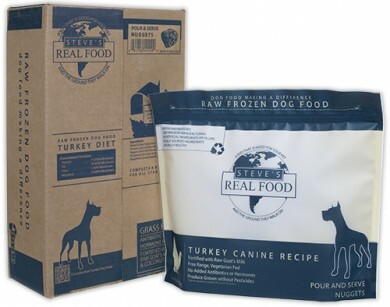 Steve’s Real Food helps to support and maintain your dogs & cats health naturally. Every Steve’s formula is PH balanced and uses only 100% natural, human grade, USDA inspected, free range meats & unprocessed whole and functional foods. 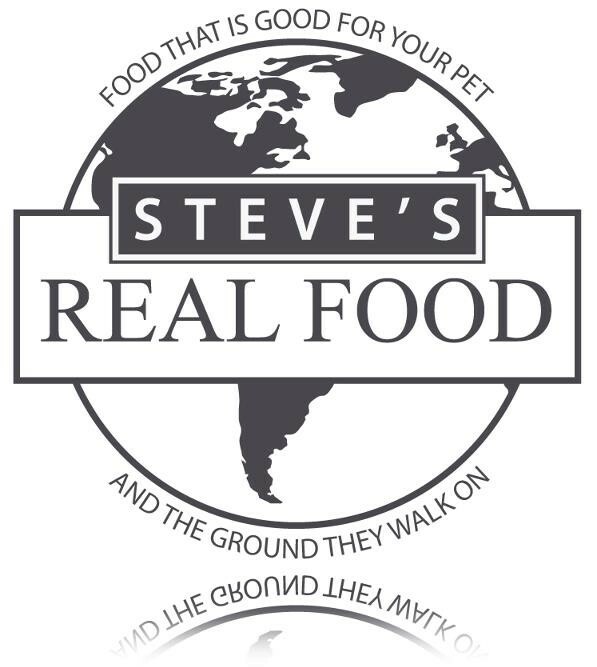 We truly believe feeding Steve’s Real Food for Pets will make a difference in the well being of your best friends and we are committed to bringing the best quality pet food and value to you! What is in Steve’s Real Food? The best quality 100% hormone-free, antibiotic-free raw meat for high quality sources of lean protein. Fresh, pesticide-free raw vegetables and fruits which provide natural vitamins and anticarcinogenic properties. All raw ingredients are ground and formed into patties or quarter inch nuggets and Instant Quick Frozen (IQF) or freeze dried to seal in all the freshness and nutrition. Beef, Pork, Chicken, Turkey or Turducken Meals. *suitable for dogs and cats. Beef, Pork, Turkey, Chicken & Turducken Meals. The yogurt is made with raw goats milk, chia seeds and coconut flour. Add a bit to your pets food or give as a treat! It’s super nutritious! Steve’s Real Food Yogurt is available in 16 oz. BPA Free pouches. 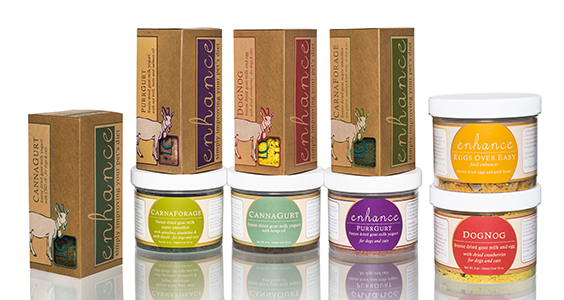 The Enhance collection consists of five functional supplements or meal enhancers that offer the benefits of raw nutrition with targeted ingredients, each designed to optimize and support different aspects of pet health. Steve’s Enhance Freeze Dried Goat Milk Supplements are available in re-usable mixing bottles containing 1.6 oz. of product and 8 oz. refill tubs. Eggs Over Easy is sold in a 5 oz. tub. All Enhance products come 6 to a case. Steve’s is now paving the way once again, being one of the first pet food manufactures to be fully committed to being green. Steve’s Real Food uses hydroelectric and wind power in their plant and their packaging is 100% recycled, recyclable and BPA free. All of their packaging is also printed with water based inks. 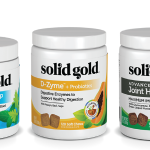 Look for Steve’s Real Food at your favorite Solid Gold Northland Retailer. 2 Benefits: healthy treat for senior foster cat with health issues; it’s not only good for her, but she loves the taste too! Review: I would definitely buy this for my senior foster kitty as a nutritious treat. How often would depend on how expensive it is. The packaging make the product easy to store and dispense which helps immensely when fostering. 2 Benefits: Easy, Dogs loved it. Con: The surrounding seal on the pouch wasn’t completely sealed so it got messy and I couldn’t mix up the chia seeds. Seeds all sunk to the bottom of the pouch. Depending on where a person lives, this might be something one could make at home. Finding ”raw” goat milk may pose a challenge though. Review: Nice product. Aside from the leaking seal on the pouches, I like the packaging. The spout makes it easy to pour. I like the ingredients. My dogs LOVED it. There’s a convenience component to being able to store it in the freezer. Because I have northern breed dogs, I like the idea of topping their food off with something cool on hot days too. Con: My pugs didn’t like the flavor. Review: I think that my pugs didn’t like this product, they turned away from their bow. I gave it to them in their dog food and by itself. It is very healthy for them. They might just need a bit more time to get used to the taste. I did try it on my pregnant pug as well, she walked away.. She is very sensitive to taste. I think it is a great product but the pugs need more time to get used to the flavor. Review: I generally make my own kefir and kombucha for myself and my dogs. The ease of just pulling this out of the freezer is appealing, but the cost is prohibitive for me. I was impressed with addition of coconut and chia as well. I have 2 dogs with allergies so the coconut is beneficial. Con: The chia seeds are a little hard to get completely mixed in. Review: My cats didn’t seem to like this at first. The old cat (19) refused to eat his food with this mixed in. After a couple of times though he ate it right up. I just mixed a little in with the canned food. I like the fact that this has the health benefits of yogurt for the digestive system. Review: Everyone in my house loves this yogurt. My dogs lick the bowl over and over and over to make sure they got every last drop. The cat starts squeaking and meowing when I pull it out of the fridge. Con: I would not use it as the sole source of food, but dogs liked it over dry kibble. I would not wish to have lots of little tubes in my freezer for frequent use. Review: We used ours over their usual dry kibble. The dogs liked it a lot and I loved that it was actually good for them. My dogs enjoy eating human yogurt on occasion, this would be a wonderful treat. Con: The only con for me was that one of the sample bags I got, the seam was broken so the yogurt spilled out of the bag. 2 Features: Free Range and Antibiotic Free!! 2 Benefits: My Dogs Gobbled this UP! Increased Energy for my Old Dogs! Review: OMG! I am not sure who loved this handy treat more, Me or all my Dogs? I have 10 dogs ranging in age from 5 months to 16 years; I know, call me crazy! Everyone loved this treat, both when served alone as well as mixed over top of their kibble. My 16 year old Cavalier really enjoyed this and she seemed to actually perk up after eating her new Yogurt treat. I plan to introduce this to my litter of puppies as well and it will be a great early food to transition to. I Really liked the convenience of this treat and all of its benefits. I will continue to buy this as a treat as well as a ”topper” for their meals. Con: Not appealing to my cats. Review: Though this product looks tasty to me my two cats were not at all interested. I tried giving it to them in separate dishes and over their dry food and they walked away from it and did not even taste it. Review: We will keep a bag in the freezer for tummy woes. 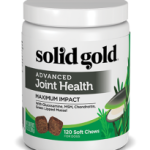 Review: My dogs loved this product will buy it in the future. Con: A lot of the chia seeds stay in the pack. Using a scissors to open the pack would be a way to get more of them out. Review: One of my 14-year old Papillons is not motivated by food. He’s not a terribly picky eater, but he would definitely choose getting up on a lap over eating many types of foods. Yet he was the one who ate all of the goat milk yogurt. He wouldn’t let his brother get to the bowl. I feel good about feeding him this because yogurt has probiotic enzymes that promote good digestion. It’s a good way to add variety to the diet. 2 Benefits: The Herd absolutely loved it! Their overall attitude improved. Review: Steve’s Real Food Yogurt for dogs & cats is a very easy to use product. The Herd always got more excited than ever to eat and ate all of the food, which was not always the case before. I feel good giving them something natural, that I know is better for them. I feel their general attitude has improved and they actually did very well through some home renovations and noise that usually would stress them out. Con: None of my cats would try this. It is raw not pasteurized so extra care in handling. The Chia seeds in a liquid have to mixed in the pouch. Maybe kittens would like this. Review: Not appealing to cats and too much hassle to use. Review: Cats: liked it better in small amounts dripped into small craters created by spoon in wet food. It took them about a week to get used to the flavor. Dog: lapped it up from the very beginning. She would probably ”wolf” down the whole thing if I let her. Review: I tried the raw milk yogurt for the this first time this week and was quite pleased with the dogs’ reaction. They loved licking it up just plain. However, for fun I added a bit of water, poured it into ice cube trays, and froze it. The dogs were thrilled to enjoy such a cold tasty treat on a hot day. I like knowing that they’re eating a healthy snack made out of such high quality ingredients.